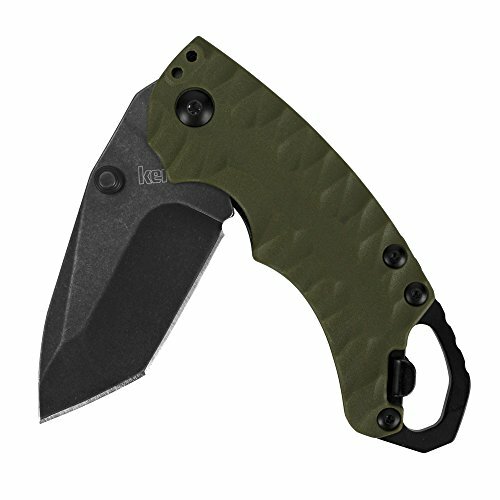 A utility knife with value pricing, Kershaw’s multifunctional Shuffle II Olive (8750TOLBW) is ideal for EDC. The 8Cr13MoV stainless steel tanto-blade keeps its sharp edge and is designed to puncture, stab, chop or scape materials. The knife serves as a multitool featuring a flathead screwdriver tip, handy bottle opener and lanyard hole. Having no shine, the blade has a black oxide Blackwash finish that is non-reflective, looks broken in and hides surface scratches. The glass-filled nylon handle in outdoors-loving olive offers increased strength, stiffness and dimensional stability and the heavily textured lines on the handle provide for a comfortable and secure grip. Dual, ambidextrous thumbstuds are positioned on both sides of blade making manually opening the knife safe, comfortable and ergonomic. The Shuffle II has a reversible pocketclip that is convenient for tip-down left or right handed carry. A titanium liner lock secures the blade open during use and prevents closure.